The year 2016 marks the 30 year anniversary of the Reykjavik Summit between Soviet leader Gorbachev and US President Regan. This remarkable meeting lead to the end of the cold war. Unfortunately recent developments are diminishing what was achieved at that time. Peace 2000 is seeking to bring the spirit back in an effort to seek for solutions to continue the path to peace. Washington, D.C. and Reykjavik, Iceland – President Ronald Reagan and Soviet leader Mikhail Gorbachev almost achieved a deal 20 years ago at the 1986 Reykjavik summit to abolish nuclear weapons, but the agreement would have required “an exceptional level of trust” that neither side had yet developed, according to previously secret U.S. and Soviet documents posted today on the Web by the National Security Archive of George Washington University and presented on October 12 in Reykjavik directly to Gorbachev and the president of Iceland. The documents include Gorbachev’s initial letter to Reagan from 15 September 1986 asking for “a quick one-on-one meeting, let us say in Iceland or in London,” newly translated Gorbachev discussions with his aides and with the Politburo preparing for the meeting, U.S. Secretary of State George Shultz’s briefing book for the summit, the complete U.S. and Soviet transcripts of the Reykjavik summit, and the internal recriminations and reflections by both sides after the meeting failed to reach agreement. Archive director Thomas Blanton, Archive director of Russia programs Dr. Svetlana Savranskaya, and Pulitzer-Prize-winning biographer Dr. William Taubman presented the documents to Gorbachev at a state dinner in the residence of President Olafur Ragnar Grimsson of Iceland on October 12 marking the 20th anniversary of the summit, which Grimsson commented had put Iceland on the map as a meeting place for international dialogue. Politburo notes from October 30, two weeks after the summit, show that Gorbachev by then had largely accepted Reagan’s formulation for further SDI research, but by that point it was too late for a deal. The Iran-Contra scandal was about to break, causing Reagan’s approval ratings to plummet and removing key Reagan aides like national security adviser John Poindexter, whose replacement was not interested in the ambitious nuclear abolition dreams the two leaders shared at Reykjavik. The documents show that even the more limited notion of abolishing ballistic missiles foundered on opposition from the U.S. military which presented huge estimates of needed additional conventional spending to make up for not having the missiles. The U.S. documents were obtained by the Archive through Freedom of Information Act requests to the Ronald Reagan Presidential Library and the U.S. Department of State. The Soviet documents came to the Archive courtesy of top Gorbachev aide Anatoly Sergeyevich Chernyaev, who has donated his diary and notes of Politburo and other Gorbachev discussions to the Archive, and from the Volkogonov collection of the U.S. Library of Congress. 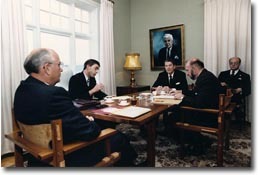 The Reykjavik summit meeting between Ronald Reagan and Mikhail Gorbachev on October 11-12, 1986 has remained in history as a near successful attempt of leaders of nuclear powers to agree on complete elimination of nuclear weapons. As such, Reykjavik has become a symbol of sorts – an example that nuclear disarmament is within reach as long as political leaders have courage to ma ke such a decision and break through bureaucratic politics and the maze of arcane nuclear balance theories. George Schultz, the U.S. Secretary of State at the time of the summit, recalled that the situation was unique because Reykjavik brought together two leaders who passionately believed in nuclear disarmament and both were prepared to act on that belief: “I suppose that what startled people in Reykjavik was not what was said, because both Reagan and Gorbachev had said that before, but the fact that here were the two leaders in an operational setting talking about timetables. All of a sudden this vision had a certain reality to it that would have changed the scene dramatically, and that really did grab people’s attention.” Yet at the time the summit was deemed a failure due to poor preparation and a chaotic negotiating process. The next, George H.W. Bush Administration, had a mantra of sorts – no more Reykjaviks, meaning no more hastily prepared summits with grand, but impractical agendas. It was only much later that Reykjavik came to be regarded as an example that could be emulated with greater success. At the same time, the Reykjavik summit addressed very practical issues of ongoing arms control negotiations and in so doing paved the way for the 1987 INF (Intermediate Nuclear Forces) and the 1991 START I (Strategic Offensive Arms Reductions) Treaties, as well as limitations on nuclear testing. These negotiations had been dragging on for many years and Gorbachev was becoming impatient: according to his close associates, he regarded progress in nuclear disarmament as a key factor in creating favorable external conditions for economic and political reform in the Soviet Union. The first Reagan-Gorbachev summit in 1985 in Geneva helped to establish a personal rapprochement between the two presidents, but failed to generate a breakthrough at arms control negotiations. Under these circumstances, Gorbachev decided to propose a “working meeting” in the capital of Iceland devoted primarily to arms control. The concept of a “working meeting” was intended to achieve two purposes. On the one hand, it allowed the two presidents to avoid the pressures and formal events of a full-scale summit meeting, especially since it was to be held outside regular venues, such as national capitals, Geneva, Vienna, or other major cities. On the other hand, neither side was prepared to hold a meeting in Washington or Moscow – it was understood that such a summit would be associated with signing a major arms control treaty, but none was in sight. Reykjavik was intended as an “intermediate” meeting that should have given a boost to negotiations. The proposal to hold such a meeting was made by the Soviets in July 1986. Six months earlier, in January 1986 Gorbachev went public with a sweeping proposal to eliminate all nuclear weapons in 15 years, by 2000, in three stages. The first stage, which was to take five years, envisaged a 50-percent reduction of strategic weapons and deep reduction of intermediate-range weapons, including their complete elimination in Europe. Although at the time many saw that proposal as pure propaganda, Gorbachev’s foreign policy advisor Anatoliy Chernyaev as well as other high-level Soviet officials disclosed subsequently that the General Secretary genuinely believed in that goal. The first stage, the 50 percent reduction of strategic forces, in particular, remained very much in the air and Gorbachev intended to use the personal relationship with Reagan to achieve a breakthrough over the heads of negotiators who seemed hopelessly bogged down in technical details. Marshal Akhromeev, the Chief of the General Staff at that time, disclosed in his memoirs that the specifics of the nuclear disarmament plan originated in the Ministry of Defense itself. Deep reductions of nuclear weapons were conditioned, however, on the United States agreeing not to withdraw from the 1972 ABM Treaty, which limited strategic missile defense, for at least 10 years. That condition interfered with the Reagan Administration’s Strategic Defense Initiative (SDI) — a plan to deploy large-scale defenses that would “render nuclear weapons impotent,” as Reagan described the intended outcome. The Soviets, however, considered missile defense dangerous because it could upset the strategic balance, especially as nuclear arsenals were being reduced. As the United States prepared for the upcoming Reykjavik summit, it came up with a bold initiative of its own — the elimination of all nuclear-armed ballistic missiles; that initiative was introduced by Secretary of Defense Caspar Weinberger. (It is an ultimate paradox, perhaps, that on both sides proposals on radical reduction of nuclear weapons came from defense establishments.) With regard to missile defense, the United States came to the summit insisting on its earlier position about broad rights to develop the system and eventually withdraw from the ABM Treaty. These and other agreements laid the groundwork for both the INF and the START I Treaties and in this sense negotiations in Reykjavik were reasonably successful. Even exchanges on the issues that remained unresolved proved valuable afterwards because they clarified the positions and the intentions of the parties and facilitated finding solutions afterwards. Discussions at the political level, which have attracted most attention in the immediate aftermath of the summit and remain the focus of attention even today, were not as successful. In the course of negotiations, the U.S. side clarified that the period of non-withdrawal from the ABM Treaty would continue for 10 years and accepted the Soviet language with regard to “strict observance” of its provisions. The agreement was not achieved, however, and the two leaders, Ronald Reagan and Mikhail Gorbachev, ended the summit with unconcealed dissatisfaction with each other and blaming the other party for the failure. 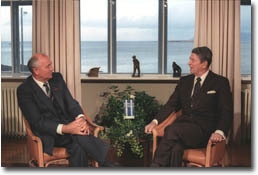 As the transcripts of discussions demonstrate, Reagan and Gorbachev concentrated primarily on the issue of missile defense with the Soviet leader insisting that deep reductions and eventual elimination of strategic weapons made SDI unnecessary while the U.S. president insisted on the continuation of the program. Besides the matter of principle, the two sides also had serious disagreements on what was permitted by the ABM Treaty: the Soviet Union adhered to the so-called “strict” interpretation of its text (hence the reference to limiting research and development to laboratories) while the United States claimed that it was allowed almost unconstrained testing. Reagan’s references to his strong personal involvement in the SDI and pleas for “personal” concessions went unheeded. Upon leaving Reykjavik, Gorbachev kept one important Soviet position — progress on all arms control fronts (strategic weapons, intermediate-range weapons, and nuclear testing) was linked to non-withdrawal from the ABM Treaty. This effectively locked negotiations for several months until, in the spring of 1987, the Soviet Union agreed to de-link the INF Treaty, which was successfully concluded in December 1987. In the following years, in spite of continuing efforts, the issue of missile defense was left, by and large, unresolved. At the signing of START I Treaty in 1991, the Soviet Union simply made a statement about reserving the right to withdraw from START I if the United States withdrew from the ABM Treaty. By that time, SDI had already been in the process of decline and it quietly “died” with the passing of the George H.W. Bush Administration to be resurrected, on a more modest scale, 10 years later. When the United States finally withdrew from the ABM Treaty in 2002, Russia did not withdraw from START I, as it had threatened, but it did formally announce its successor, START II (a 1993 treaty that had never entered into force), null and void. Interestingly, Reagan and Gorbachev paid rather little attention to a difference that was perhaps more fundamental: while the Soviet Union proposed complete elimination of all strategic offensive arms in 10 years, the United States sought to eliminate only ballistic missiles leaving nuclear-armed aircraft outside the scope of the second phase (aircraft would have been subject to some reductions under START I). The American proposal was regarded by the Soviet military as completely unacceptable: not only did the United States enjoy massive superiority in that leg of the strategic triad (the Soviet Union emphasized land-based missiles), but airbases located in the vicinity of Soviet territory compounded that edge even further. Political leaders apparently did not fully appreciate that difference in positions, which was abundantly clear to their military advisors. It seems, however, that even if Reagan and Gorbachev could have, by some miracle, achieved a compromise on missile defense, that other difference (complete elimination of strategic weapons vs. elimination of only two out of three legs of the strategic triad) would have doomed the summit anyway. Another important issue that at that time remained completely outside the purview of the talks (it was missed even by military advisors) was the 10-year period for reductions. The parties discussed two five-year periods for complete elimination of thousands of delivery systems with ease that became unthinkable only a few years later and can only be explained by the utter lack of any experience whatsoever in genuine reduction of weapons. Indeed, the first treaty in this category, the INF Treaty, was only concluded a year later. It turned out that arms reductions are a difficult and expensive endeavor. Reduction to 6,000 warheads (actually, reduction by less than 50 percent of the 1991 arsenals) under START I took seven years instead of five, and reduction to zero would have taken even longer. That is, the parties would have been forced to abandon the agreement anyway had it been reached, and the argument about the 10-year period of non-withdrawal from the ABM Treaty would have resumed with even greater intensity. In the end, discussion of very deep reductions of nuclear weapons (complete elimination of all strategic arms in the Soviet position and all ballistic missiles in the American proposal) was doomed to failure. The two countries were simply not yet ready to tackle such a fundamental decision – they lacked the conceptual foundation, even minimal experience in actual reductions, and, above all, many important issues were left outside the purview of negotiations. The summit did help, however, to resolve a number of practical issues, which helped move INF and START negotiations forward. From the nuclear disarmament perspective, the value of the Reykjavik summit was less in the specific proposals that were discussed by the parties, but rather in the fact that the two leaders boldly tackled the issue of very deep reductions – perhaps not complete elimination (for example, they did not discuss tactical nuclear weapons and the United States wanted to keep nuclear-armed aircraft), but very close to it. On that conceptual level, Reykjavik was the logical next step to the 1985 summit in Geneva, where the same two leaders, Reagan and Gorbachev, announced in a joint statement that “nuclear war cannot be won and should never be waged” – maybe an obvious point for many, but the first formal recognition of the truth by leaders of the United States and the Soviet Union. It would be perhaps folly to attempt to repeat the Reykjavik experience, but it might be desirable to resurrect the spirit and the boldness demonstrated by two leaders who, in spite of all differences between them, passionately believed in the idea of nuclear disarmament. Ambassador James Goodby, “Looking Back: The 1986 Reykjavik Summit,” Arms Control Today, September 2006, www.armscontrol.org. Sidney D. Drell and George P. Schultz, Implications of the Reykjavik Summit on Its Twentieth Anniversary: Conference Report (Hoover Press, Palo Alto, CA: 2007), www.hooverpress.org. “The Reykjavik File,” National Security Archives, www.gwu.edu. “Reykjavik Revisited: Steps Toward a World Free of Nuclear Weapons Conference,” discussants John Raisian, Sam Nunn, Sergio Duarte, Max Kampelman, George Shultz and James Goodby, http://fora.tv. George Bunn, John B. Rhinelander, “Reykjavik Revisited: Toward a World Free of Nuclear Weapons,” World Security Institute and Lawyers Alliance for World Security, September 2007, http://fsi.stanford.edu. Witnesses to the End of the Cold War, ed. By William Wohlforth (Baltimore and London: The Johns Hopkins Univ. Press, 1996), p. 170. Sergey Akhromeev, Georgi Kornienko, “Glazami Marshala i Diplomata” [Through the Eyes of a Marshal and a Diplomat], (Moscow: Mezhdunarodnye Otnosheniya, 1992), pp. 103-108. The text of both proposals quoted from “Post-Reykjavik Follow-Up, National Security Decision Directive, NSDD 250, November 3, 1986,” Top Secret, declassified on March 19, 1996, Digital National Security Archive item PR01574. The full transcript of negotiations is published in: Iz arkhiva Gorbacheva [From the Archive of Gorbachev], Mirovaya Ekonomika I Mezhdunarodnye Otnosheniya, 1993, No. 4, pp. 79-86, No. 5, pp. 81-90, No. 7, pp. 88-104, No. 8, pp. 68-78.